It feels like I've been doing a lot with these pieces lately. With my upcycled blues series, I've had several finishes (at least the tops are done); Upon reflections, however, I noticed that those are mostly crumbs quilts. I am going to now focus on strings for a while. They are faster, anyway, so the immediate gratification factor is something to consider - especially after making several crumbs quilts - and they are not fast - at least not for me. This weekend I finishing making all the blocks needed for it - 64. Well, I finished making all the center red and string parts - I haven't added the black to the edges yet to all of them. But I feel a little more organized about it now and know where I'm going! Having all the strings part of the blocks ready to finish makes me feel like I accomplished at least something. I'm taking what feels like 'forever' to finish up this top. As mentioned above, I decided I would leave off working with crumbs for a few weeks anyway and get some strings done. They are quite a bit faster than crumbs which is a big bonus to me! This week as I was working on our strings/crumbs page on the website, I realized that I have 8 quilts and tops (total) made of crumbs and only 3 finished tops (working on number 4) made out of strings. And strings are faster! Why? I don't know. I must be crazy! A lot of this is due to my upcycled blues quilts as several of the crumbs ones are from that series of quilts. I now have my next two plans after this one. I will begin to tackle them wholeheartedly - and they are both very easy which suits me when using up strings! I've decided that the one shown above was way too much fussing around for a strings top! 1. Half square triangles and an alternate block - makes a neat design with a generous use of gray to help create order from the madness of the strings. You do remember that strings/ crumbs and I aren't good friends, right? To me this looks like it is a graphic of a person sitting. Anyway...I liked the design. I couldn't wait to get going on it, so I went ahead and made up a couple of blocks. I'm going to make up blocks and try to add to this one week by week - I like the one I show with all that yellow spicing it up, so I'll dig around for some yellow and brights to try to make this one pretty! Here it is after the initial working on it. Hopefully each week we'll see progress. 2. The next strings one I want to do after that is a simple chevron. 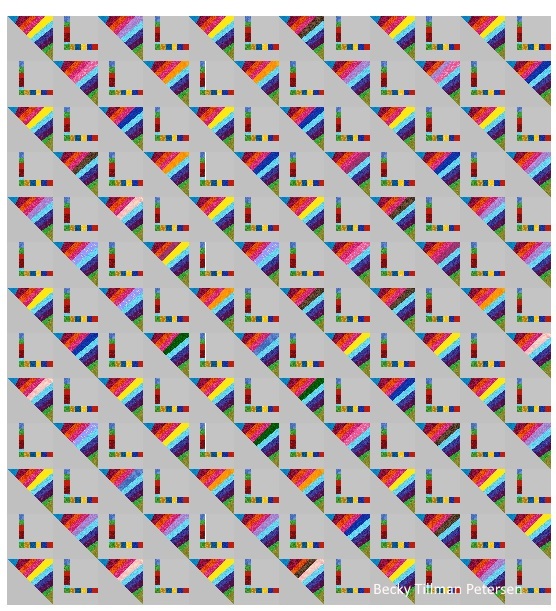 This one has all half square triangles made into a big zigzag alternating with white. This is how it will look if I pull out a lot of my brights. I'm sure the success I had with Big Zigzag (I like it) helped me decide to go ahead and let this one be my number 6 strings top. I think this one will be cool. I may even use white binding and let the design "float" in the white - using a 2" white border all the way around. Now THAT would be unusual for me! I usually bind in a dark color! While it is easy to overuse the zigzag/chevron, I decided to not worry about the fact that they seemed very trendy a couple years ago - that's about my style - catch up to what's popular right when it's on its way out! Instead I will choose to think about the fact that my mom made this chevron look in the 70s when I was in high school - or maybe it was my freshman year of college, when she made each of us 5 kids a crocheted afghan with chevrons. I don't know where mine is - but I wish I did now. So it's NOT that I'm 2-3 years past when these were "hip", instead, I'm into "retro"! I haven't started on this last one yet - I'm going to force myself to finish up that red/black one first. And that's all I did this past weekend with regards to my strings/crumbs. Wait... not entirely....That's not completely true. I did finish up A Hot Mess! I'll be taking pictures and featuring it some time in the next few days! Oh yeah, also I sandwiched Crumby Stripes! And I'm piecing a backing for strings number 4 - a top I finished in May. (When I finish writing this blog post). So, while I may not have finished a lot this weekend, I actually have been working hard on these things! Did you realize we have a page on the website that summarizes this project? It's here. Anytime you wonder what I'm up to with strings/crumbs, you can just check there - I'll try to keep that page updated as I push forward. And that's what I've been doing with my strings/crumbs this weekend! 1 yard of this fabric with a large cat design on it. Mus-Kat created byLadyfingers Studio for Andover Fabrics.